Hannibal-LaGrange University cherishes yet another successful Homecoming full of past and present students taking pride in the University. Homecoming weekend ran from October 5-6. 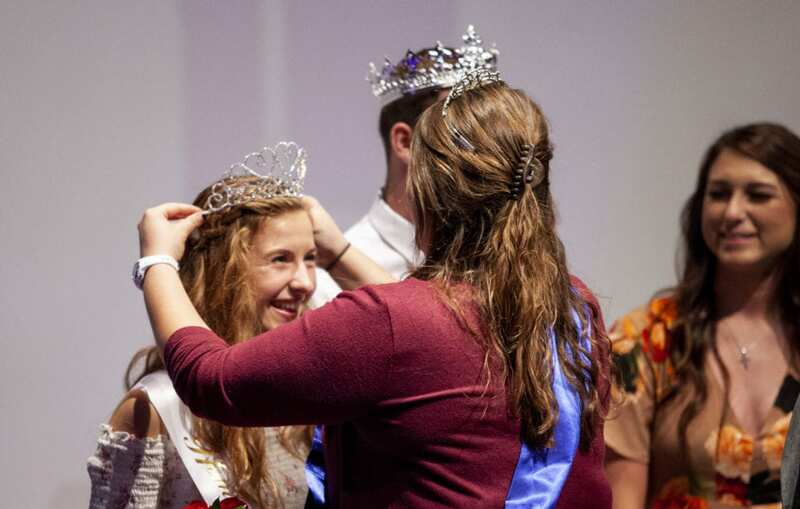 The weekend included a variety of Homecoming traditions such as a banquet, alumni games, the alumni art show, and the crowning of Homecoming King and Queen. This year, Homecoming honored HLGU classes of 1968, 1978, 1988, 1998, and 2008. With the amazing pride the students take in their campus, Homecoming has become a cherished event, this year kicking off that Friday with the Annual Alumni Golf Classic at Norwoods Golf Course in Hannibal. Later that night, many joined for the Annual Homecoming Alumni Art Show; this year in particular featured individual works from HLGU alumni. Friday night also featured the Homecoming Banquet in the Mabee Sports Complex. This was followed with festivities in the Roland Fine Arts Center, including the crowning of Homecoming King Michael Casebolt and Queen Tessa Starbeck, recognition of HLGU athletes, recognition of the 50 year reunion class, and the announcement of this year’s alumni award winners. The evening wrapped up with entertainment provided by comedian Jaron Myers. This year, the Distinguished Alumni Award was presented to Dr. Sherri Elliott-Thomas. Dr. Elliott-Thomas was born in Chillicothe, MO. She earned her Bachelor of Science in Education from HLGU in 1986 and went on to earn her master’s degree from Truman University, an education specialist degree from Union University, and an educational doctorate degree from William Woods University. She has an extensive resume including many awards and recognitions. She currently works for the University of Missouri as a school improvement consultant. She is married to husband Kent and is a proud parent of two sons and one daughter-in-law. This year’s Outstanding Young Alumnus Award was presented to Brad Dempsey. Dempsey was born in Hannibal, and later earned his Bachelor of Science in Psychology at HLGU in 2005. Then, he completed his Masters of Education in Athletic Administration in 2009. Dempsey’s passion for education and athletics has involved him in numerous schools and organizations. Currently this includes being a member of Knights of Columbus, St. Louis Soccer Officials, Missouri Soccer Coaches, and Legends Soccer Club. Dempsey is an assistant principal and assistant varsity girls’ soccer coach at St. Dominic High School in O’Fallon, MO. He and his wife Gala have three children. The Outstanding Service Award was presented to Mark Martin. Martin is originally from Traer, IA but has moved into an apartment on the HLGU campus to volunteer as an assistant coach for the wrestling team. He graduated from HLGU with an associate degree and later went on to complete his Bachelor of Arts degree at Southwest Baptist University in 1969. Martin and his wife Marcia continue to share their passion for helping people to be successful as he brings new excitement to the wrestling program. The following Saturday, new members were inducted to the 50-Year Club. The 50-Year Club was established to honor alumni who attended Hannibal-LaGrange 50 or more years ago. Following the ceremony and medal distribution, alumni were given a tour of the campus and were delighted to see the updates made to the school they had fallen in love with years ago. Additional events on Saturday included alumni soccer games. Saturday afternoon both the men’s and women’s soccer teams faced an unfortunate defeat. The men’s team faced Lyon College from Arkansas and ended up going into double-overtime before the rival team took the win at a score of 1-0. Lyon College took ten shots during the game while HLGU took fourteen. Five seniors were honored before the game for their dedication to the soccer program. These men were Santiago Diaz, Philip Kamletz, Isaac Lehmkuhl, Hugo Lopez, and Micah Thompson. The women’s team also faced Lyon College, but unfortunately lost 2-5. After their game, the women’s team celebrated their three seniors, Skyler Evans, Maria Monteiro, and Stephanie Venvertloh. Winter Homecoming is scheduled for January 26.